Finding a decent spinning reel for under $100.00 is tough. However, the Creed GT 3000 makes it easy. It offers some very nice features and delivers at only $89.99. One of the nicest features is the lightweight Air Foil carbon handle with EVA foam knobs. The knobs further cut down the weight and are very comfortable. The 10 +1 bearings are made of stainless steel. It is not a sealed unit. The spool is ported aluminum, also considered to be a lightweight material. 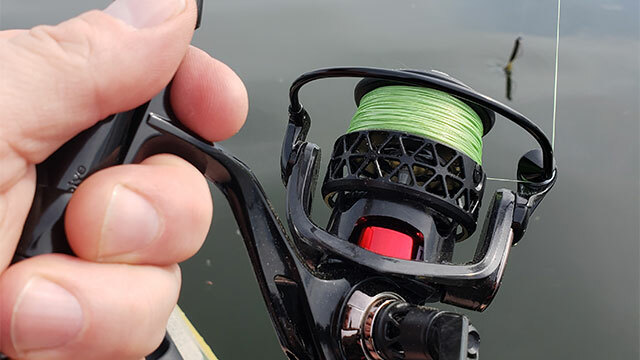 The Creed GT 3000 comes in at a respectful 8.5 ounces with a nice 6.2:1 ratio and an average 13 pounds of drag. 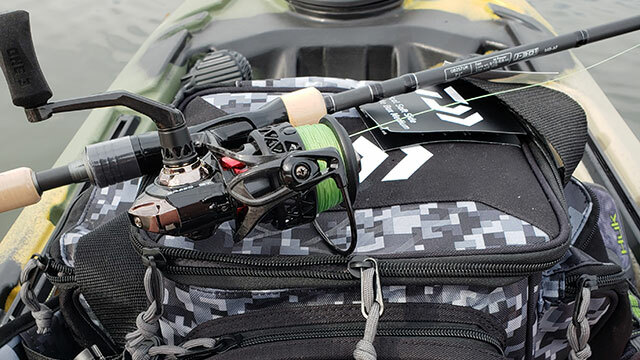 The Creed GT 3000 will spool up 200 yards of 8-pound test line or 170 yards of 10-pound test line. The whole family of Creed GTs from the 1000 to the 4000 run for $89.99 and all have a 6.2:1 ratio. The 1000 is around 7.3 ounces, whereas the largest of the family the 4000 comes in at 8.7 ounces. All come in left or right handed. One of the best things I did was pair this reel up with the Medium/Fast OMEN Black rod. The rod is made with 30-ton Japanese Toray Carbon which is considered to be a good stiffness rating for a rod blank. Transfer of sensitivity was nice. I could feel the bottom of the lake as I dragged a drop shot along it. The guides hold up well to braid and allow fluro and mono to flow through them. The full cork handle is very comfortable and the snagless hook keeper was perfect for storing my hook. Using up to 12-pound line is suggested for this rod and lure weight from 3/16 to 5/8 ounce is also suggested. Overall, the Omen Black Rod performs very well for the price and pairs with the Creed GT Reel very nicely. The only issue I have had with it this summer is that the reel keeper needs re-tightening every so often. If you choose to purchase a Creed GT you will be getting a great reel for under $100. The reel casts smoothly and at a decent distance. Bail was smooth as well and only hung up a couple of times. Weight is not an issue. I was able to cast a lot on several long mornings without wearing on my arm. For more information on the Creed GT Reel and Omen Black Rod visit 13Fishing.com.